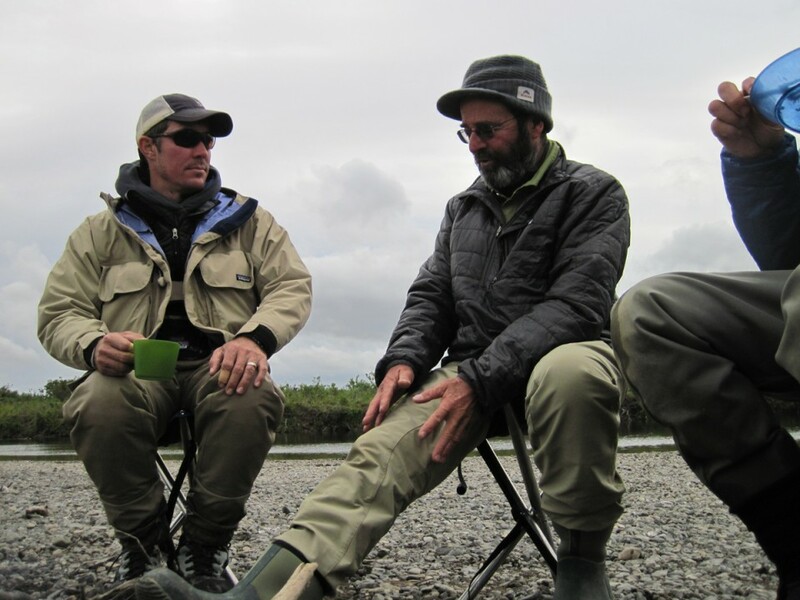 Stellar fishing in inclement Bristol Bay weather with Daryl & Brooks Emerson, Mike Deciano, Jim Walt, Mike Hart, Robert Sanford, Sarah Menzies, & Cory Luoma. From the Log of August 19, 2012: “An authentic day of Alaska bush plane travel”. We’d flown in to the lake through ragged low clouds, wind, a bit of turbulence, and rain showers. It was the kind of flight that when you thanked the pilot you were thanking him for having worked so very hard to make it safely through the various mountain passes. The passes were from time to time partly obscured by rain & clouds and at no time was the flying anything like an auto pilot course. This is the garden variety of weather the professional pilots of the region have to contend with as storms off the Bering Sea cycle though. The flight was a good example why you don’t want to be flying with anybody but a long time professional. It had been raining for the prior 2 days and we could see that the Goodnews lake water level had risen a few inches. The water however was perfectly clear at the river’s outlet and full of Sockeye and Pink Salmon. 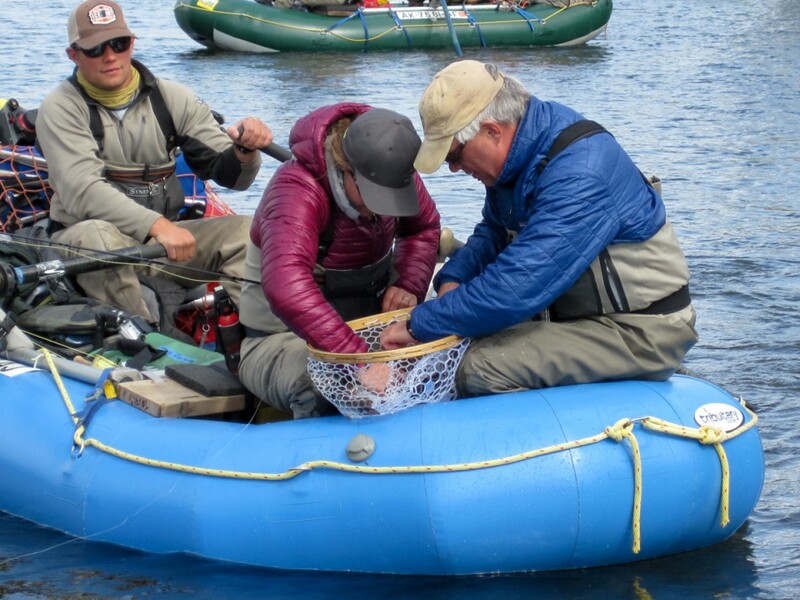 Our raft progress slowed as anglers cast, searching for trout and Char and then progress stopped, while Sea Run Dolly Varden Char were caught and released. Also from the log: “Brooks and Daryl took 3 Coho above camp and Bob Sanford took 3 Lake Trout from the camp pool. Mike released the first Rainbow Trout”. Everyone caught Char of which 3 were served with pasta, pesto, salad, and a glass of red wine for dinner. We set up tents and ended the first day of travel listening to a light rain, camped along the riverside and falling asleep wondering what this wilderness river would offer us in the coming week. From notes: “Michael Deciano’s laugh was contagious as he hooked fish. Jim Walt matched Mike’s enthusiasm.” August 20’Th dawned foggy after a stormy night. Squalls of wind and rain showers off Bristol Bay kept our weather expectations low. Still, the rain is this region’s source of the vast quantity of clear cold waters creating ideal salmon spawning along thousands of miles of salmon rivers and so I try to reflect on the critical positive role of rain as the crew prepares for a day afloat. Brooks Emerson was helping his dad Daryl take down his tent after breakfast. I watched the two work side by side and considered what a tremendous chasm of climate, geography, and ecology that they have crossed to come from their home tarpon fishing waters in the Florida Everglades to Alaska and the Goodnews River tundra for the first time. 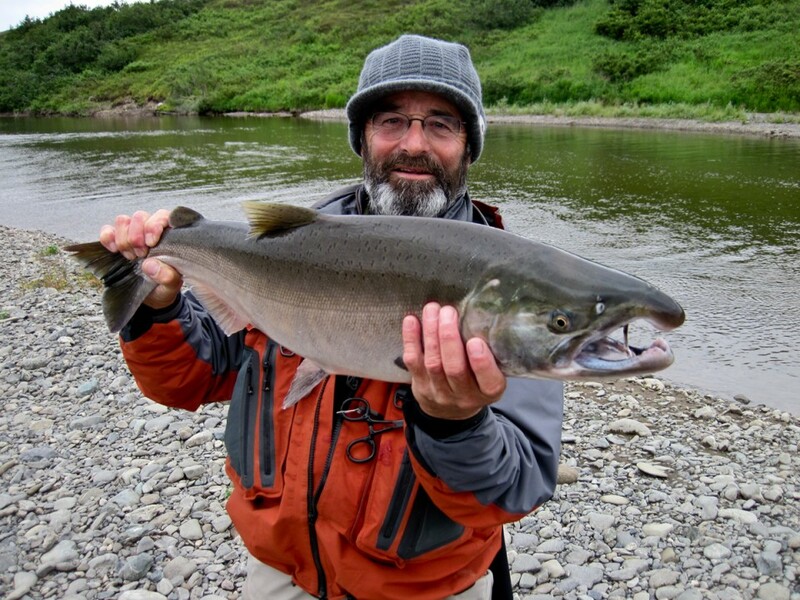 For awhile I’d worry about Daryl getting cold but by the time the sun came out on day 2 and he’d released a dozen char with a great big smile I was confident that he’d do fine in Alaska. At a notable bluff on river left, Sarah Menzies, Mike Hart, and I climbed above to get a panoramic view of the fishermen below and the valley beyond. Mike was keen to gaze down into the spawning Sockeye and spot Char and Rainbow Trout. Sarah, a videographer was taking it all in thinking about the challenges ahead working with a dramatic landscape, the fly-fishing, and the low light. I was looking at it all with an eye out for Brown Bear. The Char fishing scene that we gazed down on, was dramatic. Daryl Emerson in particular was in the right pace at the right time with the right fly. We watched him hook more than ten fish. We had lunch and took enough time for everyone to fish while Sarah and Cory spent some time shooting video of Bob Sanford, one of the most productive anglers I’ve ever fished with, as he cast. Later as full afternoon sun emerged we passed between tundra bluffs and rock outcroppings and minor rapids ending the day in a nice camp below a canyon. 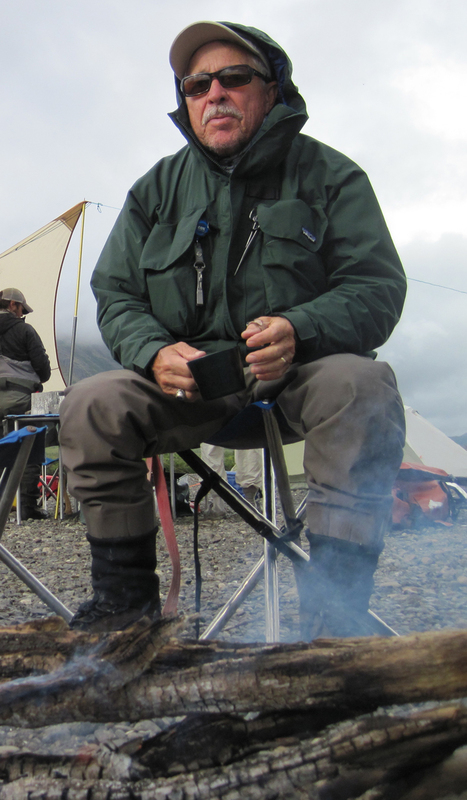 From the log of August 21, 2012 after 2 days of raft travel and hundreds of fish: “Foggy and moderately windy all day yet it never was truly foul weather. 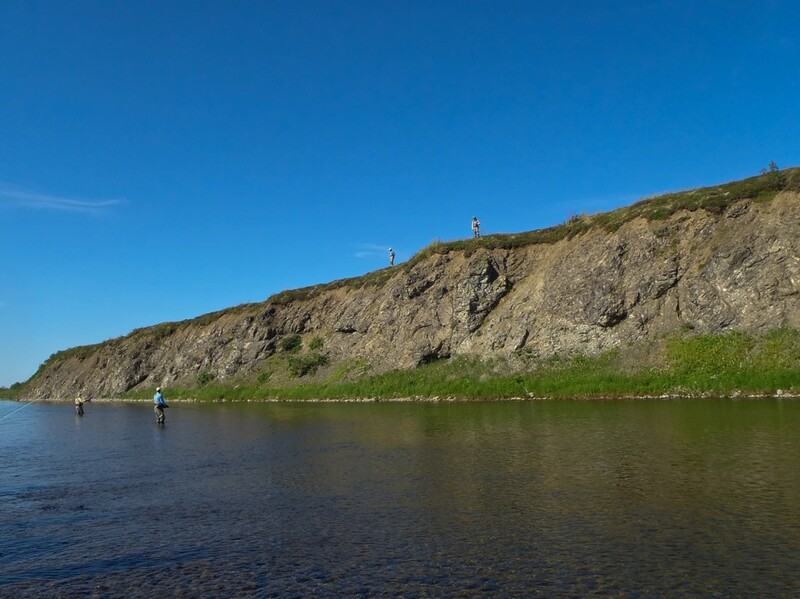 Such weather as we experienced is a fairly typical and fully workable for a day of fly-fishing near the Bering Sea! We would plunge into the epicenter of the Dolly Varden fishery today and tomorrow and edge closer to the lower river Coho water. 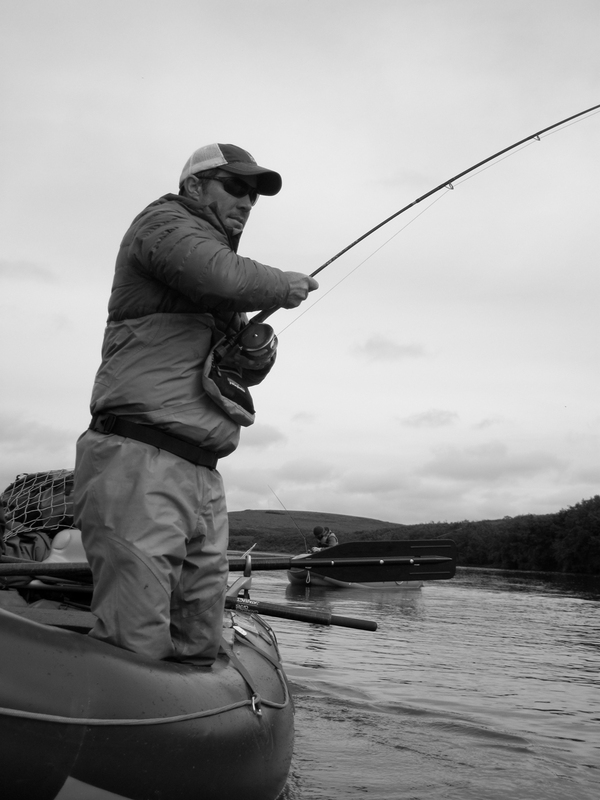 So we pushed off in our rain gear into the mist with Char rods in hand and Coho rods at ready. As it developed the fishing started off strong and got stronger all day. 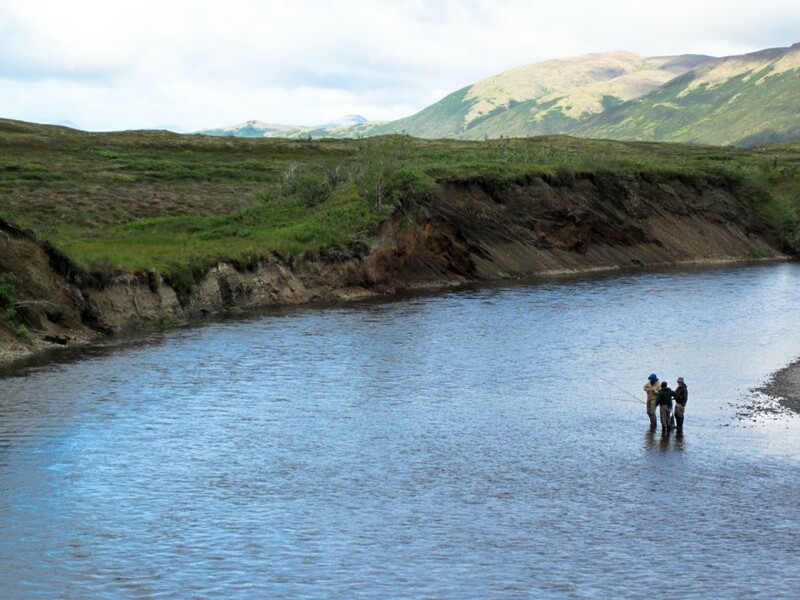 If you are a person for whom quantitative data tells a story then consider that Daryl & Brooks Emerson, father and son, sitting side by side in Olly’s raft fished the same water all day and father took in excess of 30 Dolly Varden Char while son took only 1 Char. If that’s all the data you had then it wouldn’t be clear what happened to Brooks? But when you consider that father fished egg patterns/ beads almost all day and son fished only streamers it begins to make sense. Indeed the Char were focused on eggs. It’s possible that Char are coded genetically to seek egg spawn above other foods. When you dig still deeper into the numbers you find that son Brooks took 12 Coho and father took 2. Each of them chose a different focus and each had a different casting style and presentation preference. Furthermore if you consider Brooks has spent a lifetime casting double hauled to Tarpon and Snook in the back country it makes sense that he was taking Coho from waters where they were not particularly concentrated. Unless you were Brooks and could land a cast in a silver bucket every time. 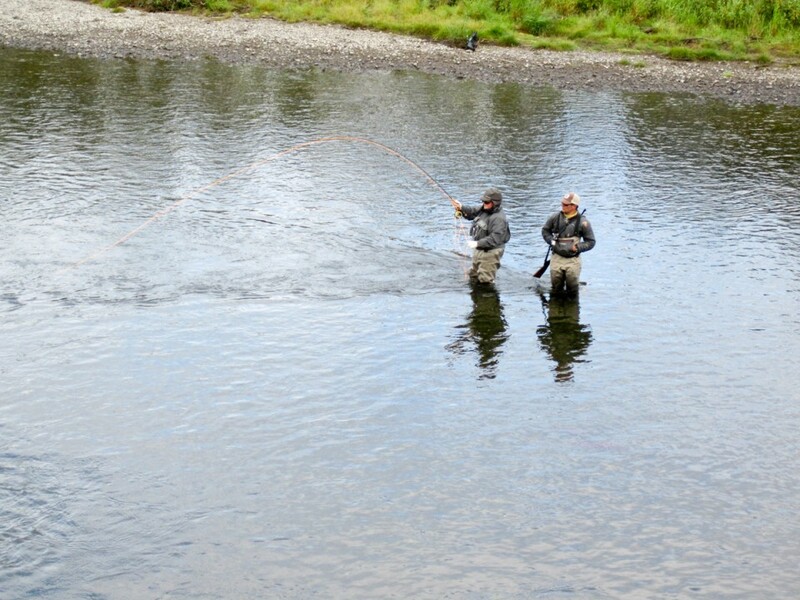 We sat in camp that evening and watched as anglers from our group cast into an eddy line and pool to a pod of Coho. The day ended as it began with mist and lots of fish. It was a nice feeling to crawl into a warm sleeping bag after a long day on the river! As we travelled down the river experimenting with where to cast egg patterns for Char and when to pick up the heavy rod for Coho we passed broods of young ducklings, generally Mergansers, but some were Harlequin ducks too. Our other avian companions were the Arctic Terns with blood red bills, plus the Bald Eagles and big Glaucous Gulls that lumbered off sand bars littered with fish carcasses. All those bird species were there for the same reason we were there. 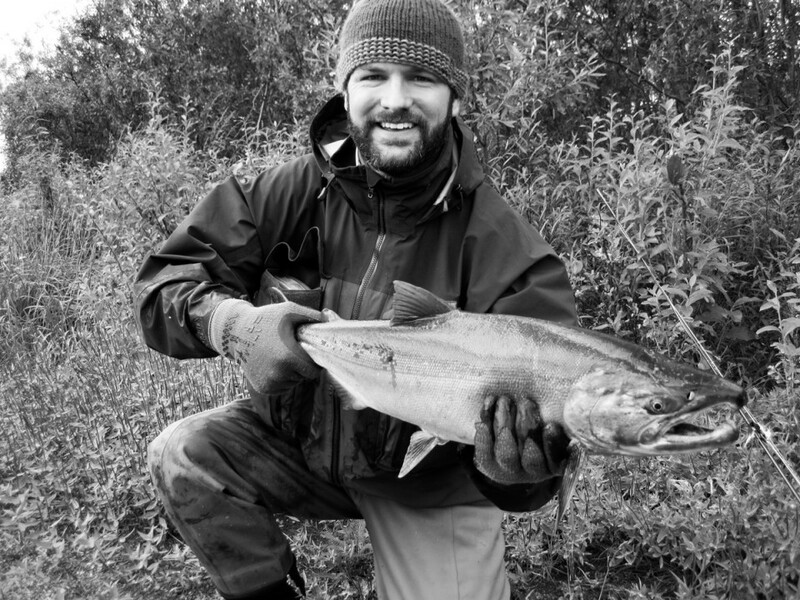 We gather to the river in July and August for the abundance of spawning Pacific Salmon. The Mergansers and Terns come to eat salmon fry. The Gulls and Eagles are there to eat carrion left by bears as well as spawned out fish washed up on the beach. We’d stop along the way to fish or to make lunch or camp and while doing those other activities notice the birds and various details of the Goodnews ecosystem reminding us that we are part of something much bigger. From the log: “Mike Hart took a really nice rainbow and in excess of six Coho today”. I don’t publicly report (it seems like bragging) the numbers of Char when they exceed several dozen for a given angler. Having said that, when I looked at the numbers in the log for Mike I know he had a really great day. 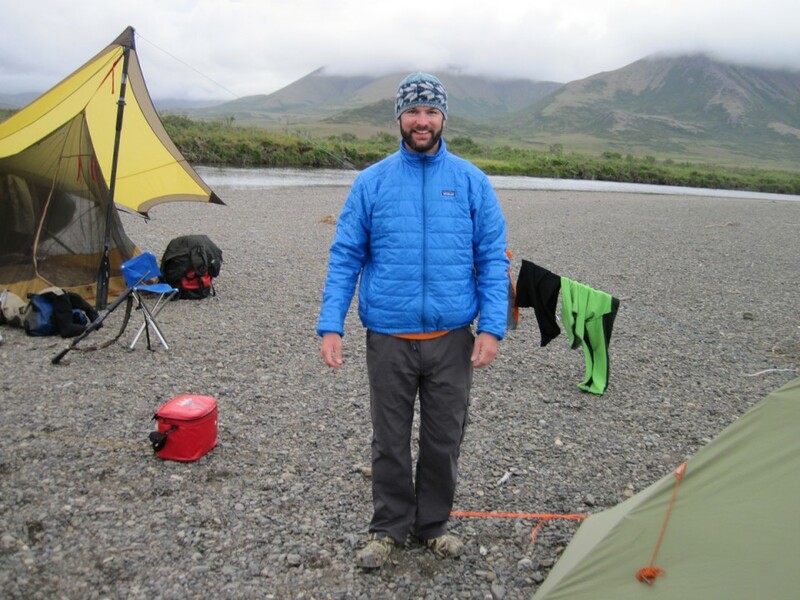 Mike had come from Vermont to join us and to experience a week in a fully functional wilderness watershed. That is something most Americans have never experienced. He fished with great intensity. Mike and I cast together in Olly’s boat one day when the Coho salmon fishing was very intense and the casting was demanding. It was frenzied and we hooked up doubles or we struck and missed fish or our casts collapsed and didn’t reach the target. It was good. What a fine way to spend getting to know a new friend! Sarah Menzies, a filmmaker, joined the trip in collaboration with Trout Unlimited. Cory Luoma, the film director, along with Sarah became absolutely integral to the group and both were a source of lot’s of creative inspiration as they filmed fly fishing scenes and shared meals and all the routines of a rafting trip. 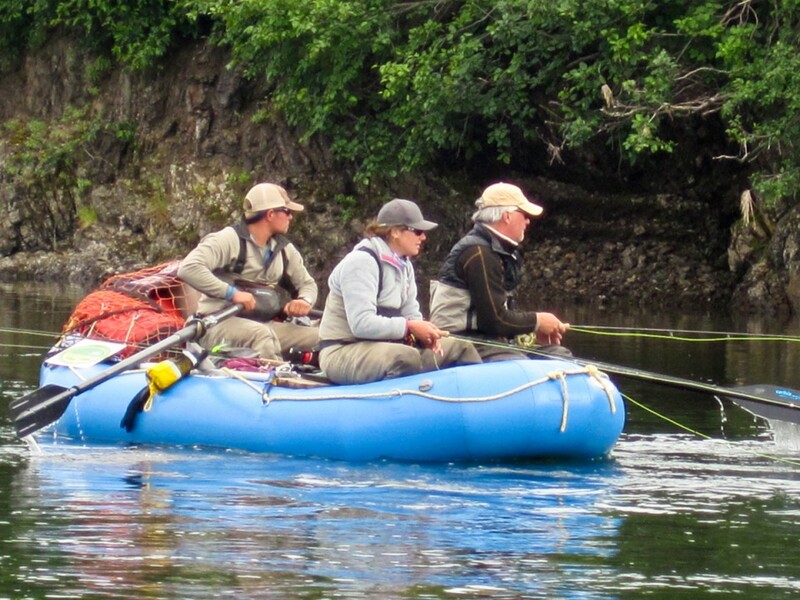 Cory, fully qualified as an expert Bristol Bay fly fishing guide, was on the oars of a raft all week and anglers rotated through Cory’s boat each day fishing with Sarah. One of the most unexpected outcomes of the week was that fishing with Sarah would become such a hit! Sarah had never cast a fly before and we watched her take those first tentative casts and then immerse herself in the casting technique, then we watched her catch her first fish and over the course of a week become a very competent angler. None of us will forget her first Coho or the intensity that she exhibited fishing for and landing the many Silvers that followed that one! From the log of August 24: “Jim Walt Slough”. We located a slough hard over on the right side of the river in an awkward location that really didn’t look like much until you waded up it. Before the afternoon was over we’d all discover it’s nature but the slough really belonged to Jim Walt above the rest of us. 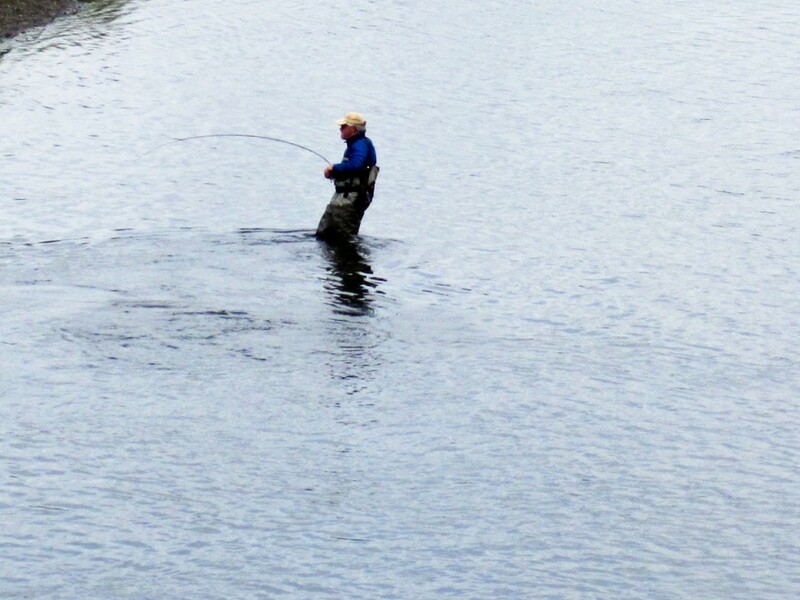 He walked beyond the other anglers who’d arrived earlier. He quietly waded out from a small point where his casts could effectively cover the channel. For the next hour he swung his streamer and caught and released fish after fish in what I’ll call Jim Walt slough in the future! We ended the day eating steamed Coho rolled into sushi rolls with Wasabi sauce. 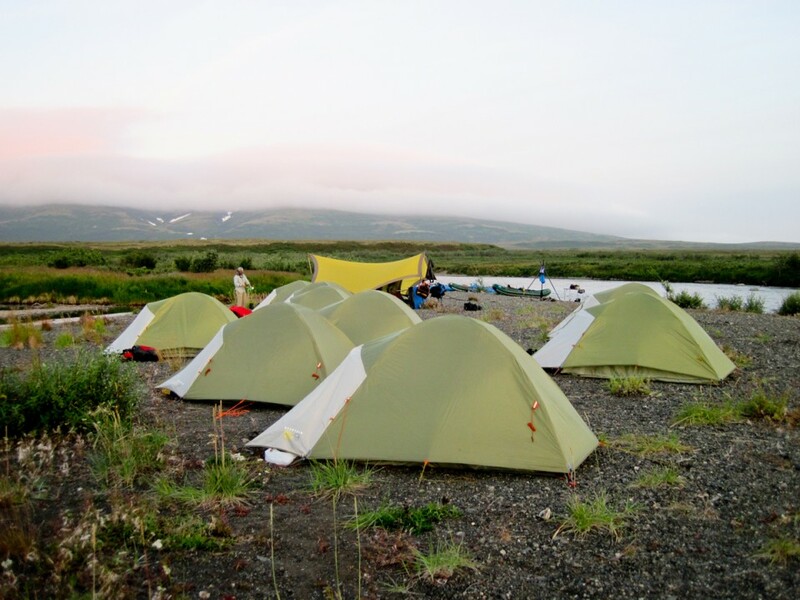 Our camp was situated on a vast gravel bar in the lower river. From the log of August 25: The sun broke out above the dark cliffs along the left bank. We floated below the basalt rock cliff sight fishing to Coho and all 4 boats hooked up, some doubles. For the next 2 hours we caught and released fish beyond count along the band of cliffs. Everyone did well. It was so extraordinarily lovely as the wind died and the sun popped out while we fished. We ate salmon and crème cheese on pilot bread for lunch and watched as our friends rowed out toward the cliff and cast. It was very rewarding and the afternoon was still young. 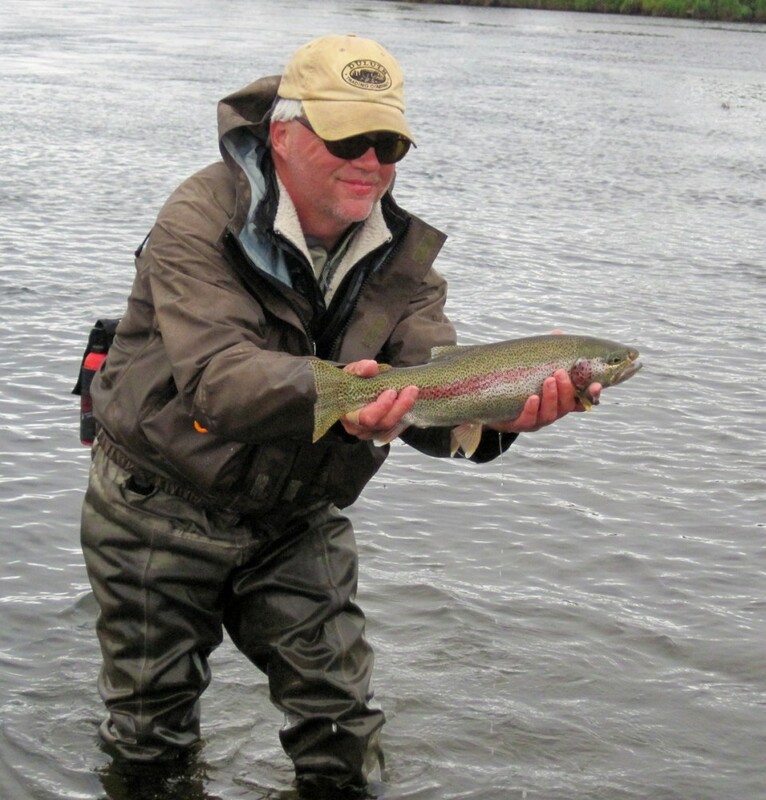 We were now solidly in Coho water with enough trophy Rainbows to make it interesting. 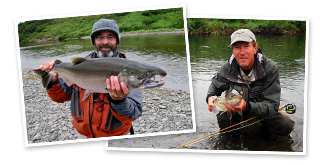 On a trip like this when we were travelling with first time anglers together with hugely accomplished fly fishers the question naturally arises “how could that work out?” How will the expectations of both ends of the experience spectrum be met? The short answer is that a raft based wilderness fly fishing trip works because the environment we’ll travel, camp, and fly fish through is so incredibly rich and undamaged by man’s prior actions that everyone experiences a maximal degree of input from the fish and the environment. The Bristol Bay region’s rich postglacial tundra landscape is sublime to gaze across. The 5 species of Salmon in the rivers are present in extraordinary numbers. The wildlife is such a big part of the world we travel through each hour. 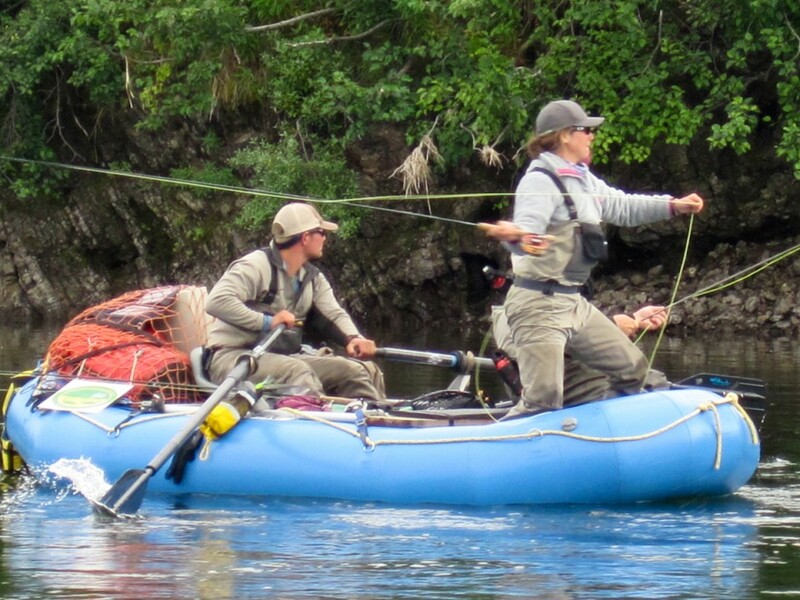 The rafting process lends itself to watching the landscape and wildlife while searching for fish. Plus the camping along the great rivers and streams is so satisfying and engaging. For example consider the fishing experience of the past week. 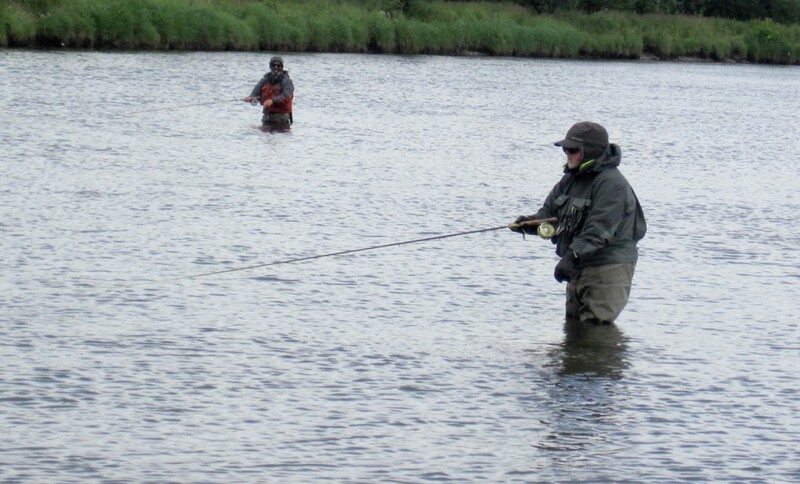 Bob Sanford’s advanced angling skills allowed him to access more difficult water with greater efficiency than Sarah could achieve as a beginner. If Bob took 8 dozen Char in a day and Sarah 1 dozen Char while they were each fully involved with the fly-fishing experience they ended equally satisfied with the excellent day. When Mike Deciano moved toward bigger water where he could use his Spey rod his angling partner Jim Walt would move to find water for the single-handed rod. At the end of the day, in a tight wind proof camp we’d sit for a while looking at the river and the tundra ridges and get ready for tomorrow, whatever it will bring. Epilogue: “What tomorrow brought.” From the log of ‘Take out Day’ August 26, 2012. The squalls of wind and rain, which had rattled our camp last night, continued through the coffee hour and then we launched rafts downriver. We’d be ready in plenty of time to greet Bavilla Merrick from Goodnews Village when he arrived to pick us up at 10:00 am. Without going into all the myriad details of the day’s travel adventures, there were many, many challenges related to the weather. The weather was what I refer to as “sideways” and was exactly what one doesn’t want on a day scheduled for flying aboard small aircraft. One can deal with “sideways” weather in a raft with a good rain jacket but no plane would come for us on this day. Aboard Bavilla’s aluminum skiff we sat with our hoods drawn close and faced away from the wind. Capricious gusts sent splashes of water into your face so you scrunched up and made yourself small and watertight. We’d be aboard the skiff for the thirty-minute ride down the estuary into Goodnews Bay to the village where our chartered aircraft would as you have guessed: Not pick us up. By evening we were safe and sheltered and warm, but not in Dillingham as scheduled. We were in Goodnews, a little village, population 250, on the shores of a small bay in the Bering Sea. I looked around our group at the expressions while we shared a simple dinner in simple shelter out of the storm. From Daryl & Brooks to Mike Hart, Jim Walt, Bob Sanford, guides Olly, Brian and Jim Bean to Mike Deciano, Sarah and Cory. After a day being exposed to the storm and all the uncertainty of raft & skiff & airstrip; their faces showed contentment. Indeed life is uncertain and nowhere more so than travel in Alaska’s bush. That night we were warm and safe and happy. We’d spend that night in the Yupik Eskimo village and continue to Dillingham tomorrow.